How to make Dairylea. - Who's the Mummy? I’ve said some stupid things in my time on this planet. Like the time I confidently wrote an article in a technology magazine deriding Twitter as a passing fad for losers. Or the time I said, “Sure it’ll fit” right before gouging a deep hole in the wall with the edge of a new sofa. Clearly, I’d forgotten my own idleness when making this statement. Either that, or I had really, really high hopes for the nanny. Anyway, as time went on I’ve become more relaxed about food, and Flea is now familiar with the noble pizza, the freshly grilled sausage, and the odd packet of crisps. One are where I refuse to compromise my principles, though, is cheese. I know many bloggers feel passionately about bacon, but for me it’s all about cheese. Whether it’s mature cheddar melted on toast, or a chunk of brie on a baguette, I love it. I vividly remember recoiling from the refrigerator in the supermarket the day I looked at the ingredients on one of those kid-friendly cheese packages to see the main ingredient listed as “cheese food”. Seriously? Life’s too short to eat something called “cheese food”. So we were both really pleased to be invited down to London to meet with Dairylea, who have recently modified the recipe of their cheese to remove all the emulsifiers and replace them with just seven entirely natural ingredients. So to make Dairylea now, you only need milk, butter, cheese, lemon juice and baking soda. (Technically you also need a factory to turn some of the milk into whey powder and proteins, but you get the idea). You can even make your own cheese spread by melting cheese into some milk, adding a bit of butter, lemon, baking soda and ‘whey proteins’ – admittedly, I’m not sure quite which aisle at Tesco those are sold on, but it was pretty good fun to make my own cheese spread. 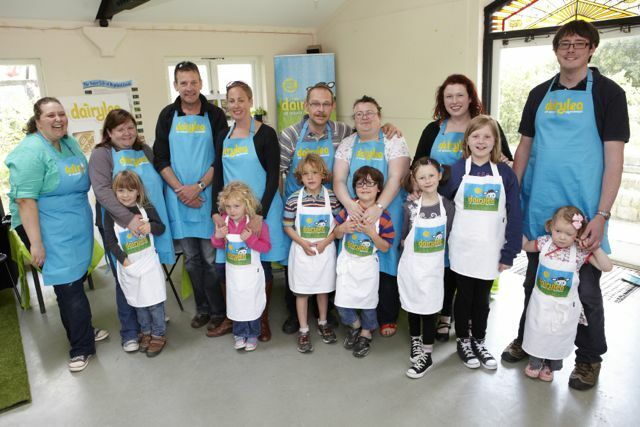 We had a fab day with the Dairylea team at Surrey Docks City Farm, with Jo, Pippa, Jen, Chrissie and Alex – the kids got a chance to meet lots of animals and also make their own cheese spread. The new recipe tastes exactly the same as old Dairylea, so far as I can tell, and it’s a good option for kids who find regular cheese too strong a flavour. I’m still not keen but Flea gave the new recipe a thumbs up. The company is also running a promotion on its Facebook page where you can reclaim the cost of a packet of new Dairylea, giving you the chance to try it for free – marvellous. Now there’s never an excuse for anyone to have to buy “cheese food”. Disclosure: our expenses to attend this event were met by Dairylea. Opinions our own. Previous Post How to make an owl costume. Second try – ignore this if the first comment came through. Just wanted to say “Hooray!” that a major food company has moved away from chemicals towards more ‘real’ food. It’s great that Dairylea has invested time and money into finding an alternative to those artificial ingredients, I agree. It’s definitely a move in the right direction for Dairylea! char recently posted..movie screens, magazines and boogie scenes.. Sounds like a step in the right direction but I’m a cheese purist and my kids would much prefer a hunk of good old mature cheddar. Or here’s an idea for a cheese spread, melt said mature cheddar, put some on a knife, spread. It’s a winner I’m sure of it. Hmm ok you may have a point. How about this then dairy lea as a marg alternative in a proper cheese sandwich ? Well, personally, I prefer a bit of brie and basil, but I’m basically pretentious. I made those same silly statements. I do try and feed my LO home cooked food often but we’ve slowly left organic behind. It’s way too pricey. As for the cheese, mmmm. I just think you forget when you have a baby that your kids are people and just as opinionated and unique as you! We are also lovers of “proper” cheese, and Isabelle has actually never liked DairyLea spread, but we might give this new recipe a go. Mirka Moore @Kahanka recently posted..Top Hamleys Toys for this Xmas! The new recipe tastes similar – Flea likes it, but I find it a little too mild for my taste – although you can also use it in cooking, which is great. I think basically I’m about 20% cheese at this point. Hey Buddy!, I found this information for you: "How to make Dairylea.". Here is the website link: https://www.whosthemummy.co.uk/how-to-make-dairylea/. Thank you.